Students will substitute Graduate-level credits for Baccalaureate-level credits in the RN - BS Completion program that count toward the BS degree. Students must take ten (10) credits of specified 400/600 level double-numbered courses thus reducing the Graduate level credits required for each Graduate program. Students plan their streamlined program with advisors from both the baccalaureate and graduate programs in anticipation of formal admission to the Graduate Programs in Nursing. A separate application is required for admission to the Graduate Programs in Nursing. Master of Science or Doctorate of Nursing Practice Nursing Plans of Study and Application can be found on the Graduate Nursing website. Applicants must be currently admitted WSU Undergraduate RN - BS Completion students in order to qualify for the RN to Graduate Nursing Pathway. Applicants must also meet additional admission requirements and should also consult the WSU Graduate Catalog. Separate formal application to the Graduate Programs in Nursing is required. The application deadline for this program is Oct. 1 of each academic year. Acceptance in a program area is not guaranteed. Further information can be obtained from the Graduate Nursing website. 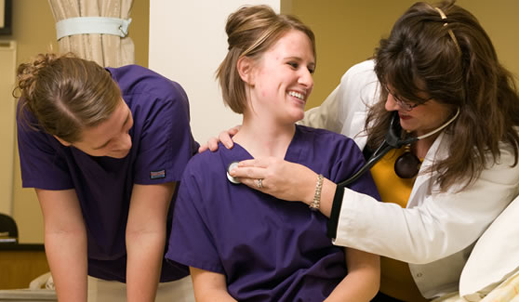 Once accepted, meet with assigned Graduate Nursing Advisor. Must meet admission requirements of Graduate Programs in Nursing, which includes submitting a “Graduate Programs in Nursing BSN-DNP or MS or Graduate Certificate Application” and all required attachments by deadline of Oct. 1. Applications can be found under Applications and Forms. Must also submit the “School of Graduate Studies Online Application." Please visit the School of Graduate Studies website “How to Apply” for application information and instructions. This application must be submitted before or concurrently with the “Graduate Programs in Nursing BSN-DNP or MS or Graduate Certificate Application” which has a due date of Oct. 1. Other 400/600 level, doubled number courses that may be taken as electives and count toward the baccalaureate degree will reduce the number of 600-level credits needed for the Graduate degree. These courses are registered at the 400 level. *Graduate level courses taken as 400-level course credits count toward the BS degree and reduce the number of 600-level course credits needed for a Graduate Nursing degree. This sample demonstrates a part-time plan of study required to complete the baccalaureate portion of the RN to Graduate Nursing Pathway.